Choosing a speciality is a life-altering decision for any doctor and we understand that they do so after careful consideration. However, with a change in time and position a doctor’s criteria about choosing a speciality do change. The recent M3 India survey highlights this fact. 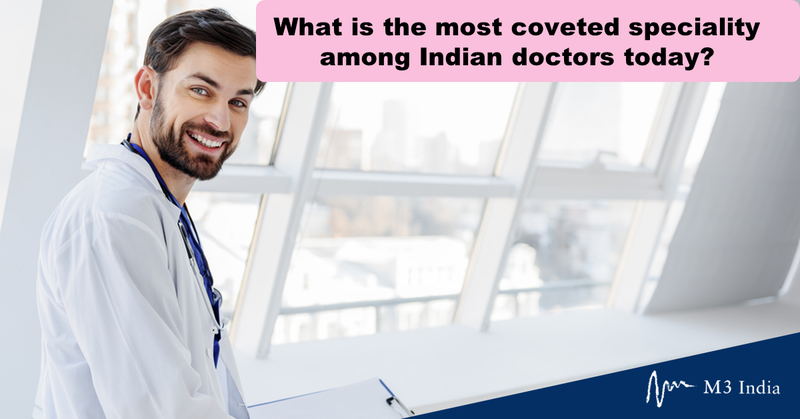 We attempted to find out how Indian doctors perceive each specialty via an online survey. A total of 471 doctors responded to this online survey. The respondents were divided into four categories viz Medicine Generalist*, Medicine – Specialists, Surgeon** and others***. Which is the most coveted speciality? General Medicine (26%) and Diabetology (22%) as the 2nd and the 3rd most preferred speciality respectively. Further, the responding doctors also picked reasons why they preferred a speciality. 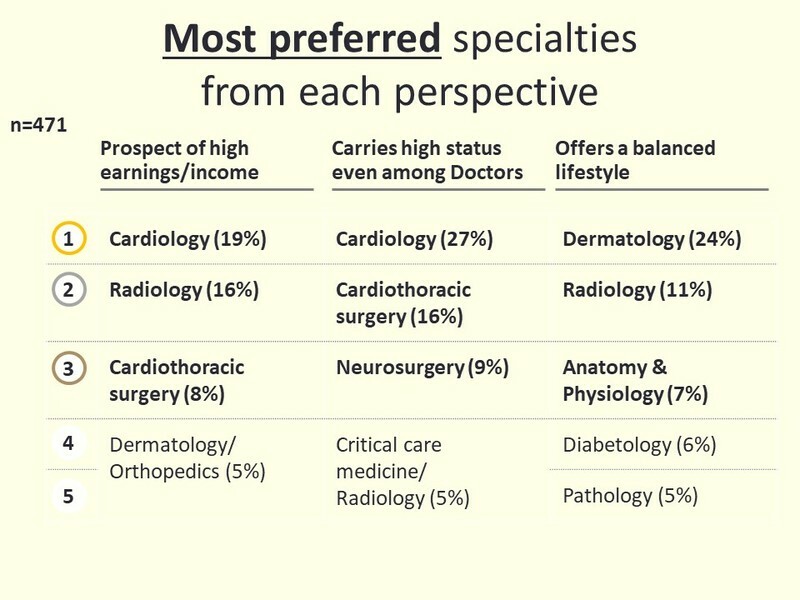 Cardiology emerged as the best speciality from the Prospect of high earnings (19%) and High status among peers (27%). Interestingly, Dermatology emerged as a coveted speciality from an ideal work-life balance perspective (24%). 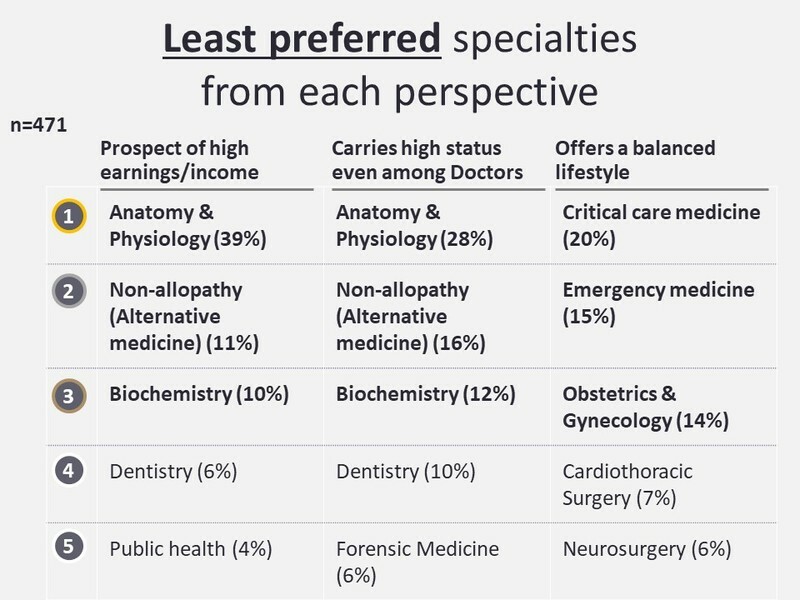 With different criteria, Doctors also picked the least preferred speciality. Critical care medicine (20%), Emergency medicine (15%) and obstetrics- gynecology (14%) were the least preferred specialties from the perspective of offering work-life balance. With doctors sharing their opinions on various specialities of medicine and picking their favourites amongst all, we wondered if a doctor’s gender plays a role here. Stay tuned, we have some more interesting facts coming up on that. Are Indian doctors happy with their chosen speciality? Is gender still a factor for choosing medical speciality among Indian doctors? The total number of respondents from the Medicine Generalists category was 160, that from Medicine Specialists category was 146, that from Surgeon category was 99, that from the Others category was 66. We have presented the data and facts as they are without generalising the results as a reflection of the views of the entire Indian doctor population. The demographic profile of the survey participants [shown above] may differ from the population of all Indian Doctors. Also, limiting the sample to the Internet channel only may introduce bias in the results. We also urge that the findings should not be interpreted as implying cause and effect.